This is the nicest efficiency in the area at this price. Located in Schumacher Place, this second floor apartment has a nice-sized kitchen with good counter space and cabinets, exposed brick, vaulted ceiling, track lights/recessed lighting and newer berber carpet. 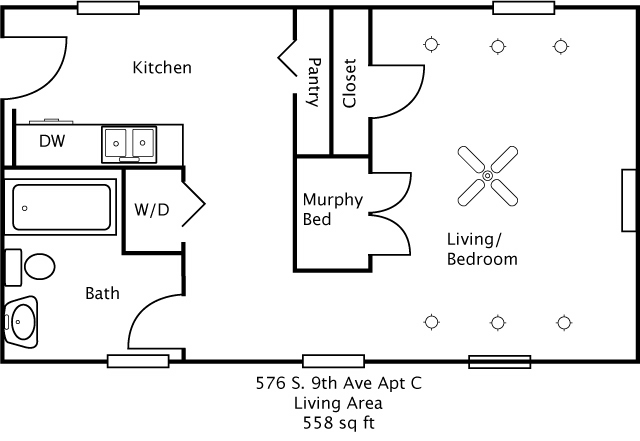 Murphy bed frame included, (Murphy bed folds into a wall closet to allow for maximum use of the floor space), gas heat and central air conditioning. Bonus features include a dishwasher, washer and dryer, nice shared yard. Please, no pets. Tenant responsible for all utilities: gas, electric, water & sewer.